Confession: I've always wanted to read Darwin's Origin of the Species but I'm too intimated. I attempted it once but after reading the first couple of sentences, I panicked and ran. 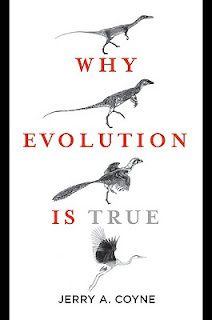 So when Chris said he was going to read Why Evolution Is True by Jerry A Coyne for Amy's 50 Books Challenge, I saw it as an opportunity to read about evolution. Turns out, while Origin is the book that started it all, it is just a drop in the bucket of information about evolution. Since Darwin's time science has grown in knowledge through breakthroughs in genetics and paleontology. Coyne explains how these discoveries add validity to the theories of Darwin. Could he have imagined the mapping of the genome or the images of a baby growing in utero? I had a hard time reading the chapters in fossils (yawn) but Why Evolution Is True's chapters on human beings were fascinating. I had to talk about it with someone. My husband asked me, "Why do you keep talking about appendix?" accompanied by strange looks. But I thought that information was just too interesting to keep to myself. The book is fairly easy to read and I recommend it. So why is Why Evolution Is True important enough to have made it on the 50 books for Our Times list- one of the books that "open a window on the times we live in, whether they deal directly with the issues of today or simply help us see ourselves in new and surprising ways."? I think that can be answered in the Preface. Coyne fears that the Darwinism is at risk of becoming an endangered species, that the politics of Creationism will interfere with scientific study in the classroom. Although Coyne shows his disdain for Creationists, he points out the barbs they have made toward Darwinism. I see it as a really nasty game of "Red Rover." "For those who oppose Darwinism purely as a matter of faith, no amount of evidence will do- theirs is a belief not based on reason. But for the many who find themselves uncertain, or who accept evolution but are not sure how to argue their case, this volume gives a succinct summary of why modern science recognizes evolution as true." He doesn't exactly have to twist my rubber arm but he does give a thorough explanation of evolution. For me, the best chapter is the last "What About Us?" where he tells us that believing in evolution doesn't lead to cats and dogs living together. "Evolution is simply a theory about the process and patterns of life's diversification, not a grand philosophical scheme about the meaning of life. It can't tell us what to do, or how we should behave." And most beautifully: "Evolution tells us where we came from, not where we can go." That is in our hands. I've been meaning to read this, and I think I'm going to really enjoy it. I love that last quote - so many people assume that believing in evolution and being sceptic of religion equal believing life is meaningless and having a bleak outlook on everything. And that's just not true. When I saw this on Amy's list, I thought it would be a good one to read. I tend to zone out if a lot of "scientific" stuff would come up...but otherwise, I think it would be very interesting. I too have always wanted to read Darwin but have been too intimidated! Sounds like this is a great place to go. I think some of those quotes puts in to perspective how one can be religious and believe there is a meaning to life (as I do) and yet still believe in evolution. So many of my fellow religious people don't get that, I don't think. I don't think it's a this or that world. I finished reading Coyne's book recently. The best book there is for the non-scientist in my opinion. The perfect book to recommend to a creationist, if I ever meet a creationist who isn't lazy and who isn't terrified of science. Another good thing about Jerry Coyne's book is he is an atheist, so there's no nonsense about magic god fairies in there. This looks really good, thanks Chris. Sounds interesting, but I think it might all be over my head. "Evolution tells us where we came from, not where we can go." This says it all, doesn't it? Science and faith don't answer the same questions, and don't provide guidance for the same problems. If a person approaches science with the aim of proving faith, she is completely negating the scientific method, human inquisitiveness, and provable fact in favor of blind faith. Personally, I'd rather follow fact for issues that are factual. I am a retired science teacher and definitely believe in evolution - there is way too much evidence to not accept it. With new technologies there are so many new discoveries that continue to validate and strengthen the theory. I liked the quote "For those who oppose Darwinism purely as a matter of faith, no amount of evidence will do- theirs is a belief not based on reason." As a believer in God and a member of an organized religion I think the way you believe religiously should also be based on reason. In fact everything I believe should stand the test of time. I have always felt like science and faith should answer the same questions. They just go about it in different ways, but in the end both are aimed at Truth. Aren't they? Science is trying to discover the hows and whys of the world which God already knows the hows and whys. In my mind the two support each other very well. Science is a bit behind religion, but when all is said and done they should end up with the same Truth. I mean, how many Truths can there be? Very good review,Chris. I hope I didn't ramble on too much. Nymeth- Yes, I've heard that before and I don't believe that is true either. Stephanie- Some of it was hard for me but I found most of it really interesting. Rebecca- I agree, it's not a this or that world! Teabird- I really loved that quote! Booklogged- No you didn't ramble! I love how this book can open a dialogue between different people with different perspectives. Oh great review Chris!! I wish I would've read it now with you! I'll just have to throw it on the pile now ;) I've always been fascinated by how our species has evolved...I think I'm really going to like this. And I'm thrilled to hear that it was fairly easy to read! This is a HUGE topic and how brave of you to review it. I'm "on the fence" between the two belief systems. I can read and be convinced 100% towards science and then read something else and completely fall into my spiritual/religous beliefs on the other side. I'd like to read this book and learn more! Great review, I will have to pick this up. Love the quotes you shared from the book. I love this review, Chris! I have been wanting to read Origins, too, but have also been a bit intimidated! So if you felt this book was good for that, then I am definitely putting this down to read! I liked the quotes you shared, too.